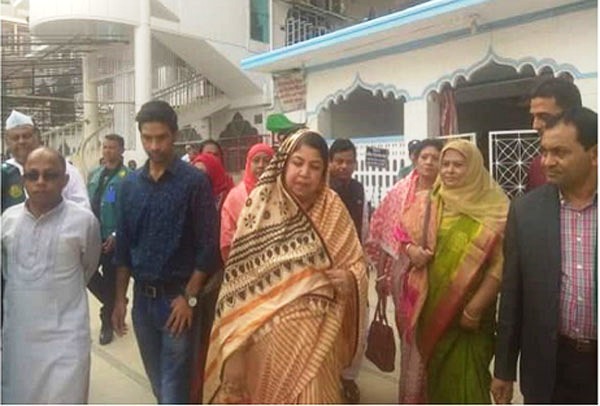 Sylhet Office : Speaker Dr Shirin Sharmin Chaudhury on Saturday visited the mazars (shrines) of Hazrat Shahjalal and Hazrat Shah Paran. She went to Hazrat Shahjalal’s shrine in the city around 3pm and offered special prayers. Later, she visited the mazar of Hazrat Shah Paran on the outskirts of the city. She offered Fateha there. The Speaker reached Sylhet around 1:20pm. She was greeted by local Awami League leaders, including its district unit President Lutfur Rahman and Secretary Shafiqur Rahman. Security was ratcheted up ahead of the Speaker’s visit, said Sylhet Metropolitan Police Additional Deputy Commissioner (Media) Md Jedan Al Musa.